Response: After you win a Military challenge in which every attacking character has the Dothraki trait, move 1 power from the losing opponent's House card to your own. Flavor Text: "It shall be done, Khaleesi," Aggo said. 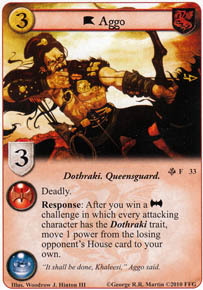 Trying to put together a Dothraki deck and this guy will be in it for sure. Every military challenge is now a power challenge. Thank you sir may I have another! Pretty sick card - if you have him out attacking Jhogo (OSaS), and Rakharo (IG) too, well, now you're getting to draw three cards (pending your current draw cap) and discarding one from their hand. All in a single military challenge - pretty crazy good when you can get that to happen. Add in their individual attachments in a perfect storm and you're just a beast (Aggo's Bow (RoR) adds unsavable kill, and Jhogo's Whip (OSaS) removes characters from challenges) Now, that all pretty much requires an amazingly lucky draw... but wow.